I struggled for a long time today with what to call these. Is it a muffin? Is it a cupcake? I couldn’t decide. Did I want frosting on top? Yes? Ok. Cupcake. But wait…then I ate one right out of the oven and YUM. MMY. So…muffin? I went back and forth, took a poll among my coworkers, did some Googling, and got nowhere. So, after much deliberation, I decided to call it a muffin. 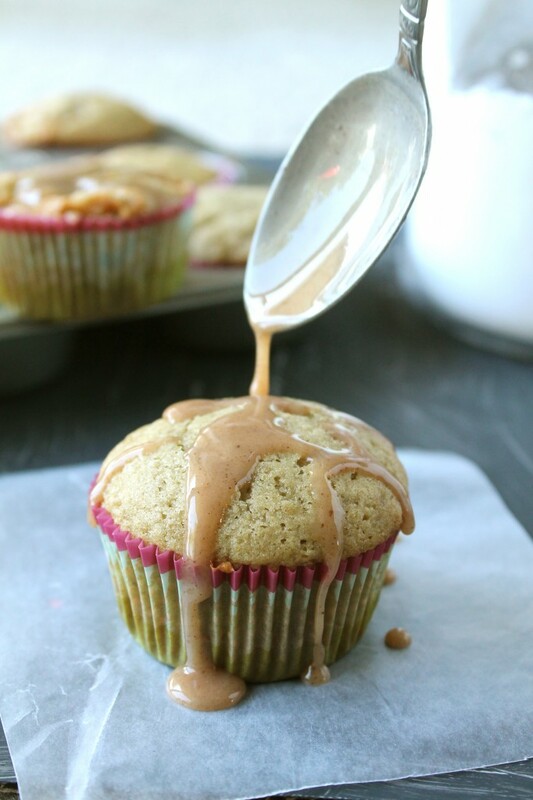 Because if it’s a MUFFIN, I figured, I can eat it for BREAKFAST tomorrow. None of this waiting-for-it-to-be-time-for-dessert business. That’s just ridiculous. I know. Best idea ever. You can thank me later. If you can bring yourself to turn your oven on in this crazy heat, it’ll be well worth it for the peachy wonderfulness that will invade your kitchen. Seriously. Roasting peaches makes everything smell SO. GOOD. Me, I’m kind of a wuss about super-high temperatures. (I’m not great with super cold temperatures either, actually, but that’s not important right now). So I baked these babies over my lunch break hoping to avoid the heat wave my oven would cause, ran out as soon as they were done, and hoped by the time I got home the apartment would be cool and breezy again. I’ve therefore decided to declare lunchtime my official baking time slot for the rest of the summer. This new (genius) plan eliminates a good hour (or four) of feeling like it’s a hundred thousand degrees (even after I’ve turned the oven OFF) and avoids an evening full of regret that isn’t really regret because yeah, I have to sit directly in front of every fan we own now but hey, at least I have this awesome muffin in my hand to make the whole thing bearable. 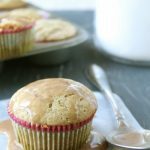 You can drizzle the glaze over these muffins with a spoon or dip the top of each muffin right into it. The drizzling was super pretty, although it made a big ‘ol mess. The mess made for a good picture but a not-so-fun cleanup. I ended up spooning the glaze over two muffins and dipping the rest straight in. Toss the peaches with the cinnamon, rum, and brown sugar. Spread in an even layer on a baking sheet. Bake at 325 for 35-45 minutes or until soft and carmelized. 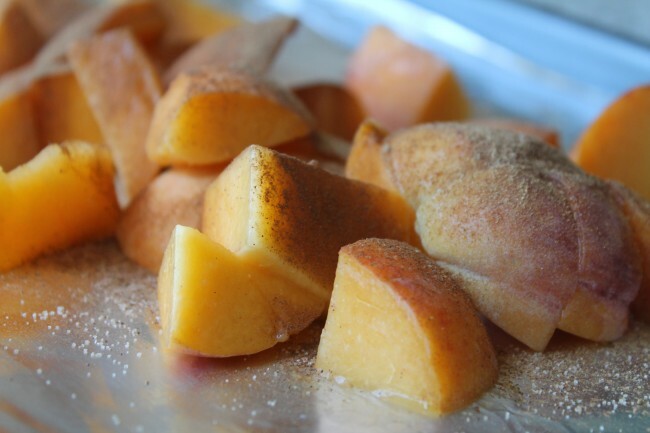 Transfer roasted peaches to a food processor or blender and blend until smooth. Strain puree through a mesh colander to remove any large chunks or pieces of peach skin. Store puree in an airtight container in the fridge until ready to use, up to 1 week. Cream butter and sugars in an electric mixer until light and fluffy. Add vanilla and eggs and beat until combined. In a separate bowl, whisk together peach puree, rum, and buttermilk. (A food processor will also do the trick). In another bowl, sift together flour, salt, and baking soda. Alternate adding peach and flour mixtures to the electric mixer, making sure to start and end with the flour mixture. I like to add 1/3 of the flour, then 1/2 of the peach mix, then another 1/3 of the flour, then the rest of the peach mix, followed by the rest of the flour. Beat until combined in between each addition. 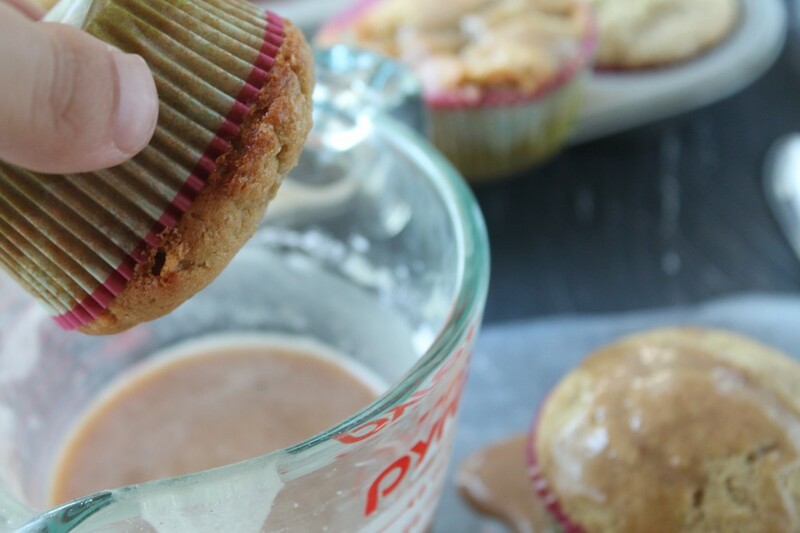 Fill muffin tins or muffin cups 2/3 full with batter. Bake at 325 for about 25 minutes, or until a toothpick inserted in the center of a muffin comes out clean. 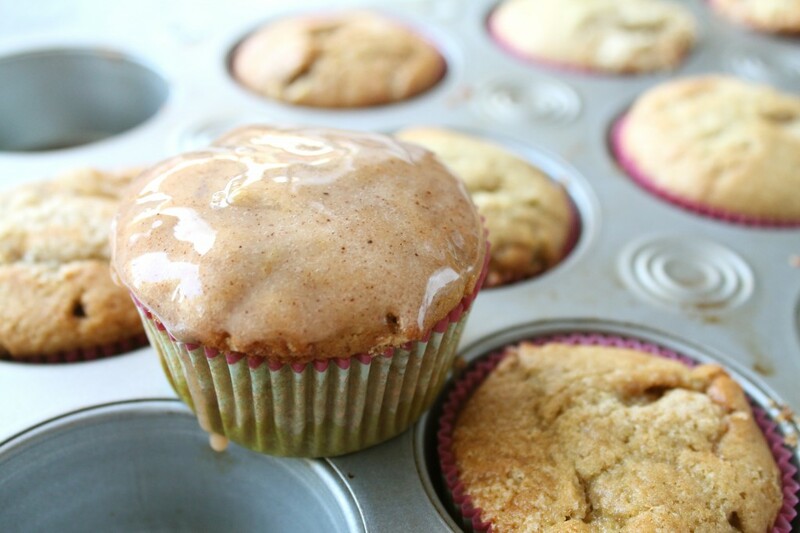 Remove muffins from oven and let cool. 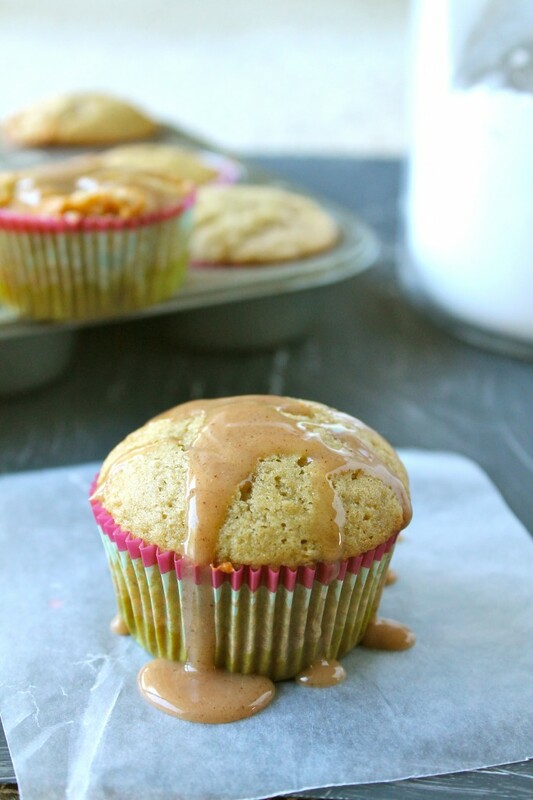 Drizzle with cinnamon rum glaze (recipe below). Store muffins in an airtight container for up to 1 week. In a small saucepan, combine rum, milk, vanilla, and cinnamon over medium heat. Heat mixture to a simmer and let simmer for two minutes. Remove mixture from heat and let cool for 5-10 minutes. Whisk together liquid mixture and powdered sugar. If mixture is too runny, add more powdered sugar or let stand until slightly thickened. 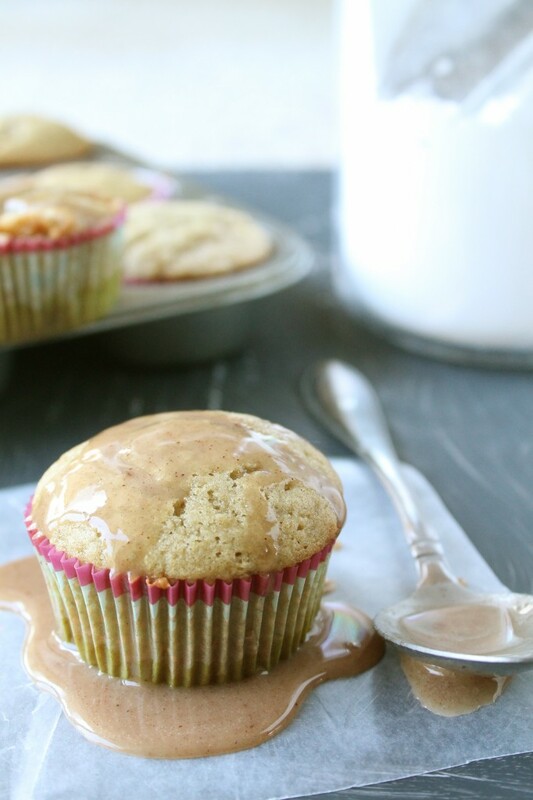 Drizzle glaze over top of Roasted Peach Muffins or dip muffins directly into glaze. Eat immediately or allow glaze thirty minutes to set. 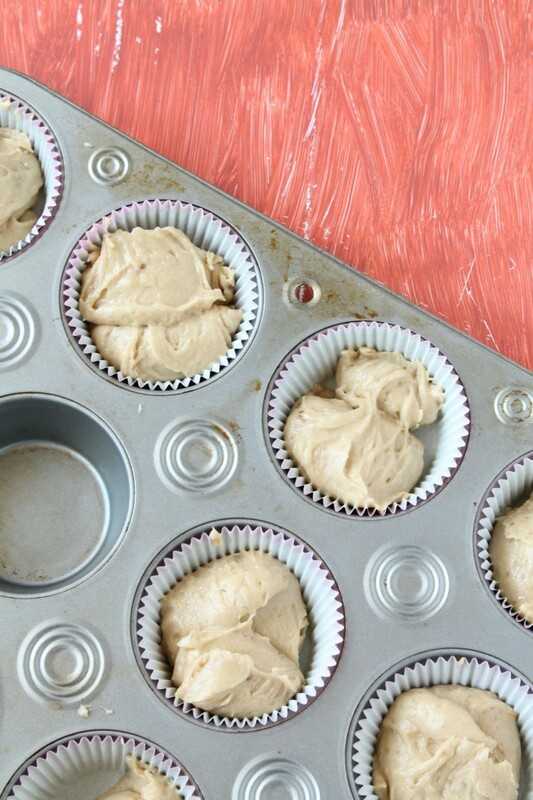 Store muffins in an airtight container for up to 1 week. *I don’t actually use buttermilk from a carton in my baking. For every cup of buttermilk called for in a recipe, I put 2 Tbsp. of apple cider vinegar in a measuring cup and fill it up to the 1 cup mark with skim or 2% milk. In this case, I used 2 tsp. apple cider vinegar and filled the measuring cup with milk up to the 1/4 cup mark. The apple cider vinegar lends a nice kick and I don’t have to worry about keeping a carton of buttermilk stocked in my fridge. This is my favorite substitute – give it a try if you want or feel free to use the real thing! Hey Jessie, I have a question! I am making 400 cupcakes for my niece’s graduation. How much icing do I need for a professional looking swirled cupcake? I’m probably going to use the Wilton 1m tip. It completely depends on your frosting recipe and style, so I can’t tell you for sure. I’d start with a frosting recipe you like and multiply it, or see if there’s a good mass-production frosting recipe online you could use (sometimes caterers or restaurants will share their big-batch recipes). Ooh, sounds fun! I’ll have to give it a try!